At the time of my protracted and painful divorce I learned to use affirmations and they really helped me get through an extremely difficult patch. Below is a list of some affirmations that I found effective. Some are specifically related to divorce, others apply to any sort of crisis or stressful period, a few are always valid. Choose the ones that work best for you, copy them (maybe even by hand) and keep them with you at all times. Look at them regularly, until they become part of your thinking. Good luck. a) Seven points to keep in mind to help you ease the pain of divorce. 1. Let go of the past; learn from it. 2. The relationship with X is over. Rejoice. 3. Drop the X issue. 4. Life will be better without X. 5. My divorce has opened the way to better things. 6. He/she is off my back. Don’t pick up that load again. 7. I am infinitely better off without her/him. b) Seven more points to keep in mind to help you ease the pain of divorce. 1. There are no endings; only new beginnings. 3. The pain will pass. 4. A new life beckons. 5. Give myself credit; keep my eyes on my own ship. 6. Go easy on myself. 7. I have a lot going for me. 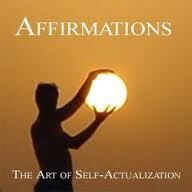 Seven affirmations about yourself that are important to bear in mind. 1. Love yourself; you are 100%; celebrate who you are. Nobody can diminish you. 2. Grant yourself the power to: be assertive, leave the prison, do what is right for you (and others). 3. Grant yourself what you need: love, warmth, affection, tenderness and appreciation. 4. Be authentic and true to yourself; this is the essence of your strength and source of your power. 5. Go easy on yourself; be forgiving and give yourself credit. 6. Find your center and create yourself out of your talents. 7. Give the whole of yourself unconditional love. This is the chi.